Discussion in 'EF's photo lottery' started by reapereviltwin, April 7, 2019. For the month of April, the EF Lottery theme will be "First Ride". For a chance to win a free one year Elite Membership, submit media of your first vehicle. This does not have to be a car/truck. Can be the vehicle that you learned to drive, etc. Goal: To encourage members of the Explorer Forum to submit a photo and/or vid, or written story in accordance with the theme and award one member with an one year elite membership. Only one submission to be entered into the drawing per member. Submission can contain multiable pics and or video(s) and/or links to pics/vids. Members are encouraged to post positive feedback. My First ride I had was a 2wheel driver 1985 Ford Ranger 2.3 4 banger 5 speed. She had the short bed and standard cab. She was Red on Red. I was young and lowered her to the ground By taking springs out in the rear and heated the springs in the front. Yes my front wheels were looking like a pyramid. It was great and I missed her. I will have to hunt down a picture of her. She was wrecked by a guy running a Stop sign and hitting me. I rolled her. Missed her and is now why I have an Explorer. Of course my entry will not be considered in the contest, but these are photos of my first ride. It was a 1972 Dodge Dart that I got from my Grandma in 1978 with just 18,000 miles on the odometer. My 1st ride that I learned to drive on (I'm pretty sure anyway) was a 1942 Bedford MW. Was part of a club in high school that had a few military surplus vehicles. The MW was one of them. Even at 15 years old, the foot well was incredibly cramped and the pedals were tiny! Great intro to learning how a clutch works too, although I messed up more than a few times there! Also had a Bedford OY - Google Image Result for https://ccmv.aecsouthall.co.uk/img/s/v-3/p801622552-3.jpg - but I never drove it. When I came in, the engine was still being rebuilt, and it was up and running just before I left. And we also had ferret armoured scout cars (mk1 and mk2) - Ferret armoured car - Wikipedia - as well as an alvis saracen - Alvis Saracen - Wikipedia - both of which I learned on. The steering wheel on those was at 45 degree angle away from you, which was odd if you were used to otherwise, but seeing as I wasn't it was great! Changing gears was also real easy, literally as simple as stepping on a pedal. We had to fuel up saracen a few times, and it was great fun standing in the 3rd gunner position, with the theme song to 'where eagles dare' going in my headphones. A Land Rover 90 - Land Rover Defender - Wikipedia - and a LR Discovery Series II (which was my favourite) - Land Rover Discovery - Wikipedia - and of course the (made famous by Judge Dredd) Land Rover 101 - Land Rover 101 Forward Control - Wikipedia - which was a beast of a truck. The gear stick was horizontal, right on top of the engine, which was your centre console. Imagine that today! Fun story, after one of our semi annual field trips, I was in the back with one of my friends on the way home, while it was being driven by one of the alumni. It'd been raining heavily all day and we had the Discovery on a trailer behind the 101. Now, we of course, had to go through some narrow side roads where grip was optional. And this was where I first saw what a fishtail was. Mind you, the only safety equipment we had was how hard we could hold on to the frame of the truck, while the trailer was swinging back and forth behind us and starting to drag the 101 with it. At the time I didn't think much of it, seemed more amusing than anything, but when we were unloading, I overheard the driver talk about how he nearly crapped his pants at losing control and was worried my friend and I would be thrown and turned into mush. Lucky for us, he was quite skilled, and didn't touch the brake pedal, only engine braked and stayed on the road. Wow that was longer than I anticipated, but hey, so those were my first rides. First motored thing I ever drove. I probably put 10,000 miles on it. It’s how I learned how to be a mechanic. My grandfather (hero) got me a factory service manual and told me he’d buy all the parts I ever needed, as long as I followed the book and put them on myself. First rebuilt motor. And carb,differential, and many other things. My first car was a Lincoln Mark 7. I got it from my mom when she bought the Buick Regal in the picture. I loved that car. Blew the doors off many a ricer in highschool. All mustang GT underneath and Lincoln style on top. I wish I never would have sold it. My first Explorer was also the first vehicle I bought. I can't get rid of the doubled photo? Looks so good, double photo saved me from scrolling back up to admire it. Ha! That's awesome. I really miss the car. It's kind of a shame that the mark series turned into a pickup. I've thought about getting another one eventually. They just aren't very common, even then it was an unusual car. I think that pic was taken in 2002. 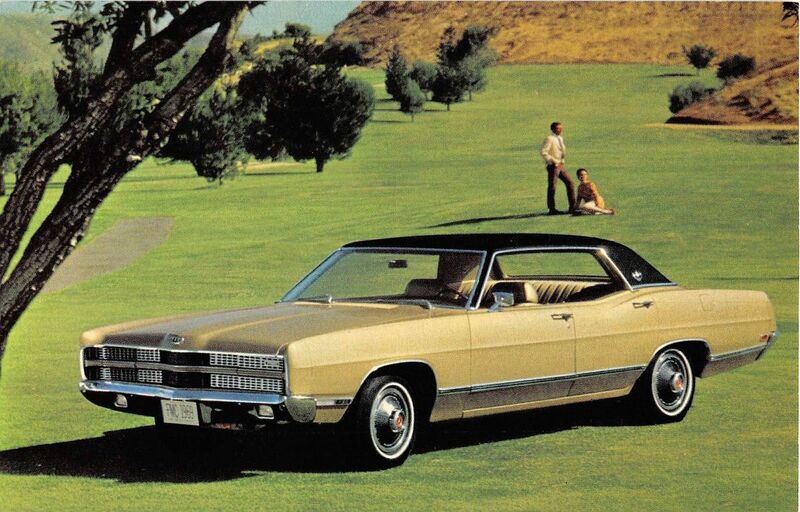 Outside bicycles and pedal cars, the car that I actually learned to drive was a 1973 Mercury Marquis. I had some brief times behind the wheel in a 1968 Chrysler New Yorker but the Mercury yacht was my learner permit car. Ugh, trying to parallel dock this beast to get my license. Then I bought a 1969 LTD as my first car. It was a tank with a 390 V8. I thought it was a heap at the time but I would like to have it now. Fittingly enough, the thing I drove legally with my permit was a First Gen 5 Speed Sport. I got my permit and told my mom I wanted to drive home. She said we’d have to go out into the country so she could show me how to drive a clutch. To her surprise, I told her I had been driving stick for years. She was impressed with my use of the clutch, but not so much how little space I left when merging in and out of traffic. Apparently, driving in leisurely traffic is different than on a motocross track. At the time we were a proper Ford family. Had the First Gen Sport, a Step Side F-150 300 in-line, and grandma was driving an early Tempo. My field truck/log skidder was even a full size Bronco on 35s. My first ride was my 1993 Explorer, still driving it daily, it has always impressed me with its of road capabilities.